Maupin made sure to engage the gallery’s artists with the renovation process from the very beginning to ensure that the space was practical for their work, as well as aesthetically minded. “We’ve always put an emphasis on creating public viewing opportunities for our artists, and really being artist motivated,” Maupin says. “And our feedback from the artists is that we create three or four different types of exhibition opportunities, not just one large open room.” Because Lehmann Maupin works with artists in many mediums, this is key. Mapuin notes that his artists visited the site, looked at models, and assessed schematics throughout the three-year construction process. On a massive wall on the first floor is Lou’s showstopping work The Clouds spanning 50 x 22 feet. Composed of 600 beaded white panels that have been partially smashed with a hammer to reveal the fraying textile beneath, the effect is beautiful, fragile, and ethereal. Though the work was exhibited at the 21st Biennale of Sydney, it has never been shown at this scale. I crane my neck to see the woven painting and even take the stair up to the second floor for a different perspective. Peering over the edge, I see Lou and her cohort of friends admiring the cloud and smiling. 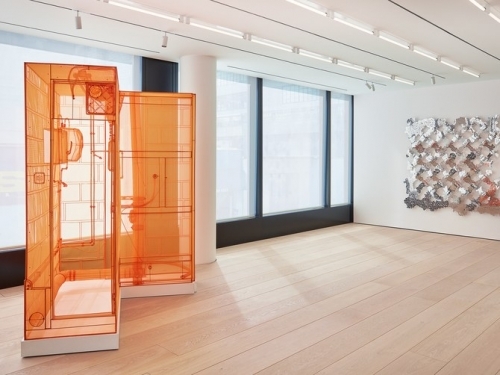 Visit Lehmann Maupin’s newest gallery on West 24th Street and Tenth Ave.